How does “Non-DAC” status allow some students with intellectual and developmental disabilities (I/DD), who are not eligible for Medicaid, to receive DDD services? This fact sheet was written for parents, educators, and other professionals who interact with students with I/DD. This fact sheet will help you with the steps to follow when requesting access to certain services from DDD at age 21 and before leaving school. Be prepared to access all available services from DDD at age 21 and after leaving school. Understanding what happens when a person with I/DD who receives Medicaid becomes eligible for Medicare. Understanding what happens with prescription medications when a person with I/DD who receives Medicaid becomes eligible for Medicare. It has come to our attention that there may be some confusion regarding the voluntary nature of D-SNP enrollment. Therefore, it is important for families and staff to understand that enrollment into a D-SNP continues to be voluntary and is not required. If anyone informs you that a D-SNP enrollment is required, please email Beverly Roberts at The Arc of New Jersey (broberts@arcnj.org) so that we can facilitate the correction of the misinformation. 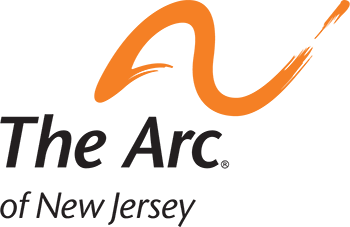 The Arc of New Jersey's D-SNP FAQs were updated because of a change that became effective on January 1, 2019, authorized by the federal Centers for Medicare and Medicaid Services (CMS). This change pertains to the process to be followed if a dual eligible who has enrolled in a D-SNP wants to disenroll. See FAQ #3 for the new information on D-SNP disenrollment, and see below for The Arc of New Jersey's revised D-SNP FAQs. Supplemental Security Income (SSI) is a federal program that provides monthly cash payments to people in need. Click here for a fact sheet regarding being eligible for SSI in New Jersey. This important flyer, developed by the NJ Department of Human Services, is applicable for persons with a disability who have Supplemental Security Income (SSI). When the individual's mother or father retires, or if the parent becomes disabled or dies, this flyer describes the process by which the "disabled adult child" (DAC) can continue to receive Medicaid. However, if the process described in this flyer is not followed, the DAC would likely lose Medicaid benefits and, therefore, access to DDD services would also be jeopardized. 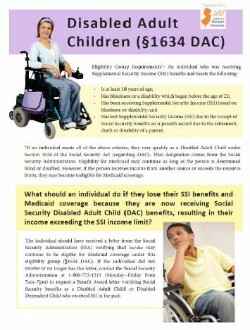 This flyer, developed by the New Jersey Division of Developmental Disabilities, describes the process by which individuals who are employed and are eligible for Supplemental Security Income (SSI) may continue to be eligible for Medicaid coverage when their earnings are too high to continue to receive SSI.